It’s especially true in summer when flowery perennials are the focus – no-one’s interested in shrubs when there are so many other exciting plants to catch the eye! But shrubs can take centre stage, even in summer, if you choose one with flower power. Try low-growing (1m/3ft) shrubby potentillas (Potentilla fruticosa) in sunny spots. They have a long flowering season, from May to September and there’s a wide range of colours, too. Try ‘Primrose Beauty’ for lemon yellow, or ‘Abbotswood’ for white. For something taller, indigofera is a fantastic summer shrub at 2-3m (6-10ft), producing magenta pea-like flowers. Or there’s lavatera, which is covered in flowers in summer and really easy to grow. Choose a striking variety such as ‘Burgundy Wine’, which is rich dark pink. In shade, grow hydrangeas. 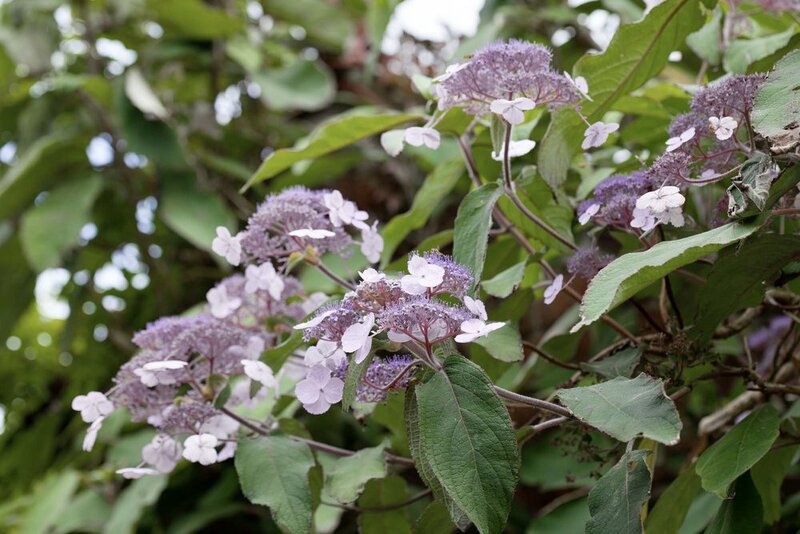 Hydrangea aspera is beautiful, with furry stems, velvety leaves and mauve flower heads, edged with delicate, pink-tinged white blooms. It doesn’t really need pruning, but can be if it’s getting too big – just cut out the oldest wood at the base in spring. It will reach 3m (10ft) tall in time. I’m also a huge fan of Hydrangea arborescens with its big rounded flower heads. ‘Annabelle’ is an easy-to-find variety with massive greenish-white flowers. Hydrangea paniculata is another gorgeous hydrangea, different because its flowers are produced in a long ‘spike’ rather than the rounded flower heads of the others. The only thing to watch with hydrangeas is that they are susceptible to drought and are always the first thing to wilt in dry spells, so make sure soil is rich with organic matter and give them a thick mulch to conserve moisture – they won’t do well in really dry shade. If you haven’t got room in your borders, you can always grow some summer shrubs in containers. Smaller shrubs are more suitable and it’s also a good way of growing more tender species, as they can be easily moved into shelter for winter. Phygelius is a great choice and there are lots of colourful varieties around.